It’s been awhile, but I’d like to make up for it by sharing and storytelling on two main character portraits today. Ambassador Ethan Fairbanks is one of the first people Arashi encounters that begins her descent into the moral grey area of the main plot. Though Morsett is an established thief, typically considered criminal in modern society, he does so with the best of intentions. Ethan, on the other hand, is a test of the player’s actual judgment on what they believe right and wrong. Having a more worldly view, along with his wisdom and life experience, he brings to the table information and advice that even Ket is not aware of, but his motivations are dubious at best. His position as a politician certainly is no small influence on his outward personality. I like this character for the sole reason he revels in the lack of trust surrounding him. As a Xalmeisian national, he is the enemy in a foreign land, but he seems exceptionally savvy and somewhat understands Arashi’s plight as a misplaced foreigner as well. I think it will be interesting to see how their relationship plays out. I don’t want to give away too much, but I almost put Ethan’s role in the game as my favorite character arc. Of course, it’s ultimately up to you – the player – to decide if he’s worth the trouble. Ethan was a character I had written in the original Shadowdawn project and his journey to where he ends up at that point in the timeline is equally complex. 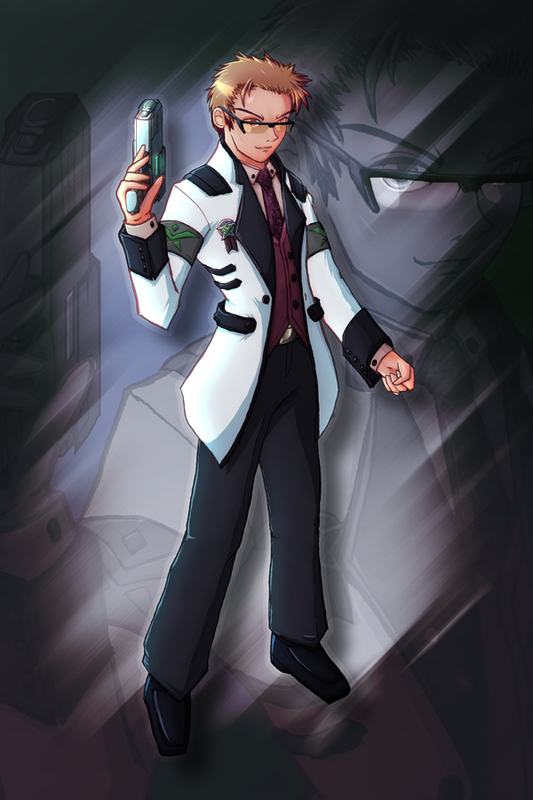 At the time, he was a minor character but a proper foil to the dualgun-wielding Tiya Koryu, another main character of Shadowdawn that unfortunately is one of the few that does not have a role in this game (she’s too young at this point). But Ethan is one of the older human characters and thus he was a prime choice for the plot to the game. In fact, the plot kind of pointed to him after I had laid it out, so it was more opportunity than a conscious plan. I was debating whether or not to give a preview of the remaining main cast, as I feel that defies the spirit of exploration in the game, but I decided that enough key art includes the “second four” that a brief introduction is fair. 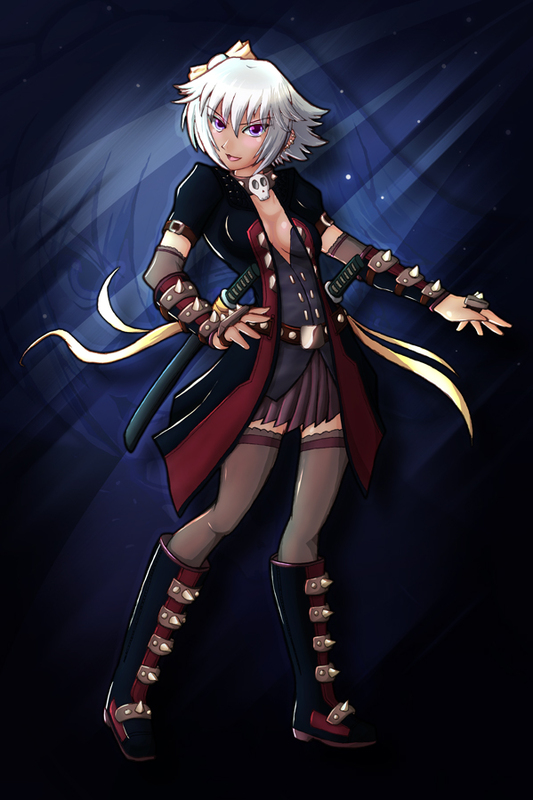 Nephele here is one of the strongest-willed characters of the group. She is also the only one with two equally skilled combat roles, hand-to-hand and dual-wielding katanas, preferring fists to steel and only using her swords when absolutely necessary. Her relationship to Arashi is extremely complicated and I look forward to seeing how players react to the character. Nephele is also the only character in the game that was completely written for it, as almost all others were previously designed (or at least mentioned) for Shadowdawn or much later stories in Euterra in a couple cases. OMG, you never played Phantasy Star II or IV? I never knew that about you! I suggest you snag the PS3 Sega Genesis collection if you get a chance, it’s got the whole series included. PSN UK also released the Vita PS Suite Developement kit beta for free, I wonder if it’d be possible to port Shadow Dawn to that without much effort. I actually own Phantasy Star IV for Genesis, I got it used from my old job, but yeah, I never had a Genesis so I never got to play them. My first Sega System was Dreamcast (but I played my friend’s import Saturn for the Capcom fighters they had). My first Phantasy Star was the first Phantasy Star Online for Dreamcast. And yeah that Commodore computer looks pretty sweet, if I have a lot of money leftover down the road I’m so getting it.